This article describes how to create a virtual relationship in DAX using the TREATAS function, which is more efficient than approaches based on INTERSECT or FILTER. A virtual relationship is a DAX pattern to transfers a filter context from a table to another, simulating the behavior of a physical relationship defined in the data model. This technique is useful whenever a relationship does not exist, or when it cannot be created because the relationship is not a one-to-many, or because it is defined by two or more columns. You can find a longer description in the article Physical and Virtual Relationships in DAX. Just to recap, we have two patterns in DAX to manage virtual relationships. The first is based on FILTER, and it works on any version of DAX. 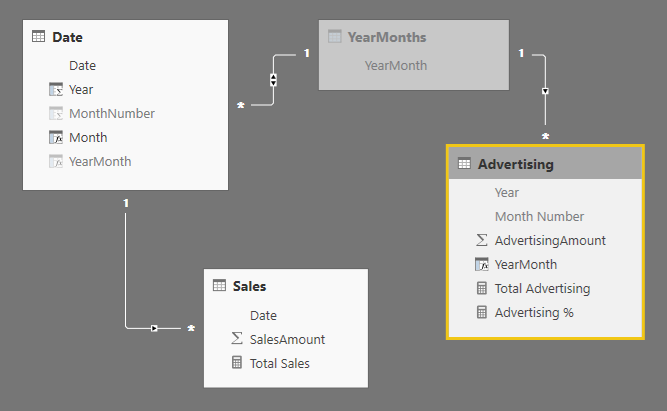 The second is based on INTERSECT, and it works on Excel 2016, Power BI, and SSAS Tabular 2016. 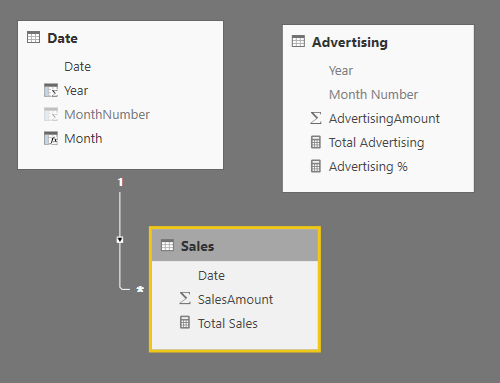 The February 2017 version of Power BI Desktop introduced a new DAX function, called TREATAS, which will appear in future version of Analysis Services and Excel. Always use a physical relationship to propagate filters whenever possible. If you cannot use a physical relationship, you should implement a virtual relationship using TREATAS. Only use the INTERSECT pattern if TREATAS is not available in the DAX version you use. Only use the FILTER pattern if TREATAS and INTERESCT are not available in the DAX version you us. If the granularity of the filter propagated is relatively small, you might consider a virtual relationship as a possible alternative to a physical one. The slower performance of a virtual relationship shouldn’t impact the overall execution time in a visible way, but remember that your experience might vary depending on the complexity of the query. Let’s see in the following examples why you should follow these rules. 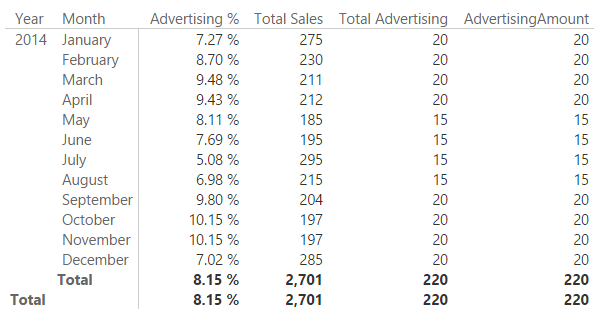 Consider a model where the Sales table has a day granularity, whereas the table Advertising has a month granularity. (This is the file “Day and Month Granularity – Without Relationships.pbix” in the samples you can download.) You cannot create a physical relationship between Date and Advertising, because the granularity is defined by two columns (Year and Month Number), and there are multiple rows with the same combination of year and month in the Date table. If you want to compare the sum of SalesAmoung and AdvertisingAmount for each month, you need to propagate the filter context from Date to Advertising. You can define the Total Advertising measure using the TREATAS function to perform this filter propagation. In the following picture, you see that the Total Advertising computes a correct computation month by month, whereas the column AdvertisingAmount simply sums the value of the corresponding column for all the rows in Advertising, because there is no filter propagation between Date (which has a month selected in every row of the report) and Advertising. If the granularity is small (up to hundreds of values), this approach is probably good enough. However, if you have a higher number of unique values propagated in a virtual relationship, then you should consider an approach based on a physical relationship. In a simple one-to-many relationship, you can just combine different columns into a single one. 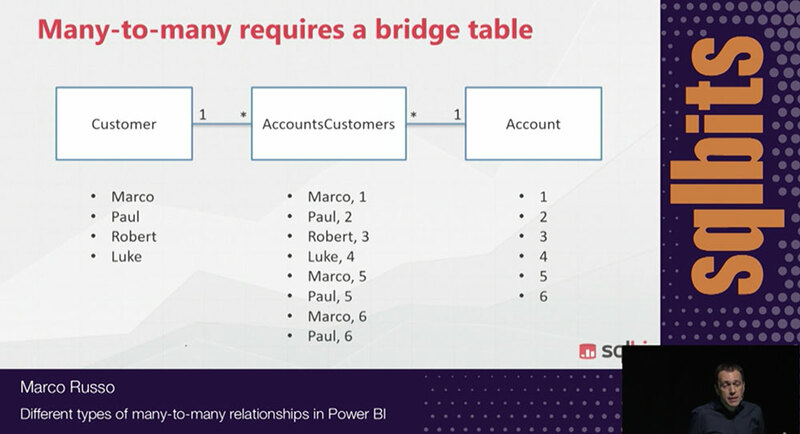 If the relationship is a many-to-many, you can implement the pattern described in the article Many-to-many relationships in Power BI and Excel 2016. You can find an example of this approach in the file “Day and Month Granularity – With Relationships” in the samples you can download. In the following diagram, you see that the bridge table YearMonths is connected to the calculated column YearMonth defined in the two tables Date and Advertising. The bidirectional filter enabled between YearMonths and Date guarantees that the filter context propagates from Date to YearMonth, and then it also goes to Advertising because of the one-to-many relationship between YearMonths and Advertising. The YearMonth calculated column simply combines year and month number in a single value. The YearMonths calculated table is defined as follows, getting the list of unique values of YearMonth from the date table Date. At this point, the Total Advertising measure can be defined using a simple SUM aggregation. 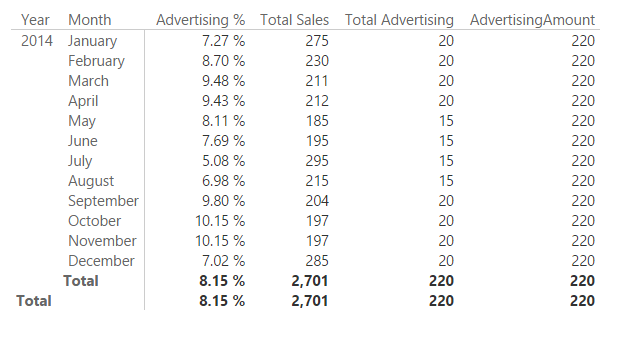 In fact, the result of Total Advertising now corresponds to the result of the column AdvertisingAmount in the report, which implicitly aggregates the corresponding column in the Advertising table using the SUM aggregation function. The approach based on a physical relationship is usually better in terms of performance. However, it requires the relationship to be defined in the data model. Sometime this is not possible, for example because you are querying a model that you do not control, or because in a complex model the presence of additional relationships would generate circular references or other undesired side effects of the filter propagation. This was not the case of the simple data model used as an example. You have seen that the best practice is to always use a physical relationship whenever possible. This is because the cost of a relationship depends on the cardinality of the filter propagated. A relationship based on a column with 100 unique values is usually faster than another one based on 1,000,000 unique values. This problem is described in more details in the article Costs of Relationships in DAX. This section compares the performance of different implementations of a virtual relationship with the corresponding solution based on a physical relationship. In the queries used to evaluate the performance, we will make the relationship active only to measure the performance of the physical relationship, whereas it will be ignored by testing the different approaches using virtual relationship. The test simply aggregates the SalesAmount column grouping the result by channelKey. What makes this test meaningful is the cardinality of the SalesKey column, which has 3,406,089 rows. In other words, we are simulating the scenario of a large dimension by using the smallest possible data model. If you want to replicate these tests on your own machine, open the HeaderDetails.pbix file, then start DAX Studio and connect it to Power BI Destkop. The virtual relationship using the FILTER technique is implemented using the following query. The approach using INTERSECT has a simpler DAX syntax. The physical relationship is the best approach. The query simply activates the existing relationship. This approach provides the best performances, because it removes the need of materializing a large number of rows that must be computed by the formula engine. The join between the two tables and the aggregation is entirely computed by the storage engine, obtaining an improvement of two orders of magnitude. In the following table, you can see a comparison of the execution time between the different techniques. Using TREATAS you can run a query in 50% of the time required by the FILTER approach, whereas INTERSECT has only a marginal improvement (13%). TREATAS is the clear choice when you implement a virtual relationship, but you can also see that with a large dimension the advantage of a physical relationship is huge. These differences are barely measurable for relationships with a low granularity, making the virtual relationship a possible option in those cases. You should run similar tests on your own model to verify that the virtual relationship has a cost that you can afford (the advantage is that it has no impact on the data model). When you define an arbitrary shaped filter, the TREATAS function has flexibility and efficiency that is harder to obtain using INTERSECT. For example, you can write this calculation to retrieve the quantity of Blue products sold in France plus the Green products sold in Ireland. Using the CROSSJOIN you materialize a table that is not required. You can optimize this by filtering only the two colors and two countries upfront, so the CROSSJOIN only materializes four combinations, but the entire process is removed by using TREATAS, which creates an arbitrary filter that is pushed to the storage engine in a direct way, without having to materialize a table in advance. This could result in much better performance in scenarios where an arbitrary shaped filter is required, especially when you combine columns from different tables. The TREATAS function is the best way to implement a virtual relationship. This approach is good if you have a small number of unique values to propagate in the filter. However, you should always consider that a physical relationship can provide an improvement of one or two order of magnitudes for a high cardinality relationship. 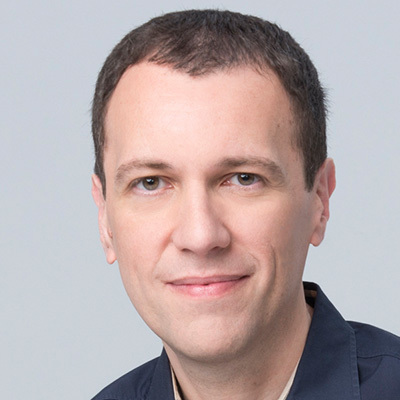 In complex data models, the virtual relationship could be the only option, because additional physical relationships might have undesired side effects in the filter propagation to other tables.